Help an independent bookstore: buy a book! 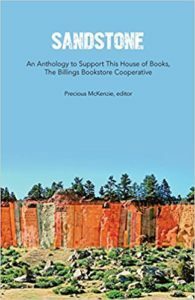 The profits from the sale of Sandstone, an anthology of contemporary Western writers, go directly to This House of Books, Billings’ first cooperative bookstore. You’ll read stories and poems here from writers you love: Tami Haaland, Shann Ray, Jamie Ford, Anna Paige, Dave Caserio, and many more. I’ve even got a few in it.